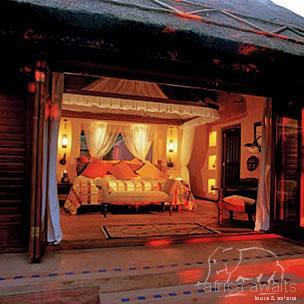 In the north of Botswana lies Chobe Chilwero Lodge, one of the most enchanting places on earth. With gorgeous, breathtaking vistas as a backdrop, you'll come face-to-face with the abundant creatures of the bush, and some of the most spectacular sunsets Mother Nature bestows. Deep in the heart of Botswana wilderness lies Chobe Chilwero Lodge, one of the most enchanting places on earth. With gorgeous, breathtaking vistas as a backdrop, you'll come face-to-face with the abundant creatures of the bush, and some of the most spectacular sunsets Mother Nature bestows. You will enjoy creature comforts - elegantly appointed accommodations, silver service, gourmet meals and fine wines. Relax in the luxurious thatched cottages, with ensuite, sunken handcrafted baths, indoor and outdoor showers, private gardens and terraces overlooking the magnificent Chobe River. There is also a library, curio shop and a communications centre. Although located in Botswana, this small, intimate lodge is easily accessed from Zambia and the world famous Victoria Falls. Guests can enjoy a day trip to visit the falls if desired. Game activities at Chobe Chilwero are scheduled flexibly, according to the whims of guests and the changing habits of the game. Thrilling guided game drives in open vehicles bring you to the heart of Africa's largest concentration of elephants, as well as hippos, buffalos, puku, antelopes, lions and other creatures that gather on the Chobe River's banks. Or join the acclaimed guides on a wondrous water safari on specially adapted motorboats. Sundowner cruises are particularly spectacular on the Chobe River. Fishing excursions are also available. End each day with a refreshing dip in the swimming pool, followed by a sumptuous meal lovingly prepared by their expert culinary staff - a delicious, eclectic fusion of Western and African cuisine and delicacies - all topped off by a sampling of vintage wines and spirits from the cellar. It's the perfect complement to your one-of-a-kind African adventure. High teas are often served on the lawn under the shade of the trees. 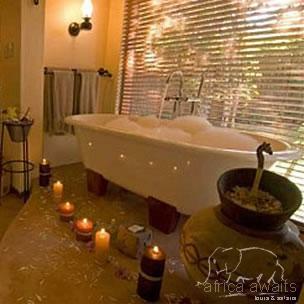 Superlative game viewing and silver service may now be combined with the ultimate in pampering: in-room spa treatments. Therapies range from a Clarins Ultimate Firming Facial to a Full Body Swedish Massage, to relax and invigorate in true African style. The lodge offers 15 luxury air-conditioned units, each individually appointed with furniture and fittings from all corners of the continent. In addition, each unit has its own private "sala", both indoor and outdoor showers, along with large handcrafted sunken baths. Chilwero also offers a split-level swimming pool. Guests come to the Botswana bush to get away from it all - thus Chobe Chilwero has not installed telephones or televisions in the individual rooms. But if business cannot be kept at bay, a small business center offering telephone, email and fax services is available for guest use. In addition, a small library has been built which could also be used for lectures and nature talks. This room also houses a television, VCR and slide projector. Safari activities at Chobe are diverse, exciting and tailored to suit individual requirements. Game drives are conducted in open 4x4 vehicles, normally in the early morning & late afternoon, under the leadership of qualified Botswana guides. 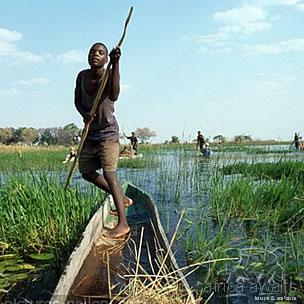 The Chobe floodplain is renowned for its concentrations of buffalo & elephant. The late evening in particular, provides spectacular viewing. All vehicles are equipped with two-way radio systems, thus facilitating optimum sightings of the major species. With your holiday, safari or business trip from in to Chobe Chilwero in Namibia.